What is a Hemipelvectomy Amputation? Basically this amputation is the removal of the entire lower extremity on one side as well as the removal of half the pelvis. The separation is generally made at either the sacroiliac or symphysis pubis joints. In laymen’s terms, a hemipelvectomy amputation is the removal of a leg as well as the hip from one side of the body. How do you come to terms with such loss and get back on your feet? With Jaco Deist in your corner it’s not as daunting as it sounds. David lost his leg in an accident when he was only three years old and has spent the last eighteen years walking on two crutches. That was, of course, until last week before Jaco Deist did the final fitting of David’s new prosthesis. Jaco Deist first met David when he came to the practice looking for a new pair of crutches; what he left with was so much more. Just so, after meeting David it is safe to say he is one of the most positive human beings I have ever come across too with his unfaltering drive to be independent. 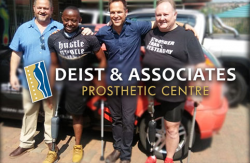 He was told independence would never be possible for him, but with the help of Jaco Deist and Antonie Schutze (TUT Orthotics and Prosthetics Technologist) we witnessed David walking with the support of only one crutch. The short time the prosthesis has been available to David, and the speed with which he got accustomed to using it, is significant given it has been eighteen years since he could stand or walk with either of his hands free. Antonie Schutze says, “Everyone just needs a chance, the chance everyone deserves.” With their help David has a new lease on life and the joy is written across his face. Watch as David takes some of his first steps with the help of a Rheo Knee, fit for him by Jaco Deist. The prosthesis for a hemipelvectomy is larger than most and may seem cumbersome to those who cannot imagine ever having to replace a hip and leg. However, David says it takes only moments to put on and take off – he also happily announces that he can wear the shoes of his choosing with his new prosthesis. He sees no inconveniences or hassle – only opportunities and hope. Deist himself said that it is usually the patient’s attitude which convinces him of the success the patient will have with the prosthetic he gives: not the patient’s condition. Kurt sustained his injury in a motorcycle accident in 2015 when he was hit by a car that skipped a red light. The accident shattered Kurt’s pelvis which has made his recovery a long and gruelling one. His foot was amputated onsite and he has had twenty-two operations since to get him where he is today. When doctors said Kurt would not walk again he started to pursue a future where this would not be a reality. That is when he met Jaco Deist who he had heard about via Facebook. With continuous physical therapy, using his prosthesis is becoming more and more comfortable and he learns as the microprocessors in his prosthesis do. Kurt said as soon as he met Jaco he could tell there was a high level of integrity and honesty that he applies to his work. Kurt confides that Deist and his team are empathetic in the true sense of the word, they do not pity the people they help; they come from a place of understanding. “Jaco Deist and his staff are incredibly helpful people who have helped me achieve extraordinary results,” says Kurt. When asked about the role Jaco Deist played in his recovery he said, “This man creates miracles,” and adds that, “…the fact that the prosthesis fits so well gives you confidence.” This nugget of wisdom was shared with David as he tried to walk down an incline after some advice from Kurt, Jaco and Antonie. David simply and quite promptly replied, “Let me try it!” He not only tried but succeeded in negotiating the incline with his new prosthesis on the first try. Watching two people that by most people’s standards would be considered to have lost something was inspiring. They come across as the richest people you have ever met: exceedingly friendly, funny and virtual beams of light. Upon walking together with David for the first time Kurt shouted, “Let’s race!” much to David’s delight. Their positivity is infectious and spending an afternoon with them reminds you of the power of the human spirit. David and Kurt are proof of what can be achieved with a positive attitude and a professional like Jaco Deist in your corner. Deist jokes with David saying that now that he has a hand free he can hold a girl’s hand while they take a walk in the park, to which David blushed through his ever-present smile. Rochelle, Kurt’s wife, beautifully sums up her husband’s recovery until this point saying that with the prosthesis she can hold Kurt’s hand while they walk again for the first time in years. Jaco Deist is a professional prosthetist and orthopaedist but all his patients will argue he is much more than that. He is a crusader for his patients as well as a confidant and friend. To read more stories and see more videos of the breath-taking work Jaco Deist does, visit our blog page and YouTube Channel. If you require any orthopaedic or prosthetic assistance, do not hesitate to contact us.